When you go to pluck a Budweiser from a cooler anytime between May 23 and the November election, it will plainly read “America,” as if brewed from our very amber waves of grain. (Though their site informs us that they borrow some of Canada’s barley waves too.) This is great news for anyone looking to get their patriotism in a drinkable format. 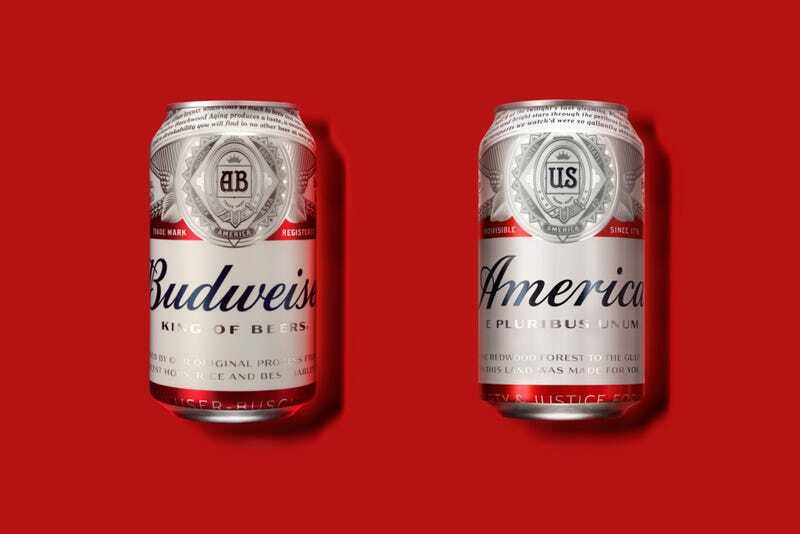 Budweiser’s parent company, Belgium-based Anheuser-Busch InBev, always cooks up some patriotic summer labels for Fourth of July sipping, but this year’s perverse branding extremes were likely intended to sync up with the Summer Olympics and presidential circus show. With beer brands always locked in their own Olympian struggle to present as more American and regionally loyal than one another, this feels like an absurd checkmate. Part of the imminent, unironic branding strategy is the new tagline “America is in your hands,” which frankly inspires more concern than pride, especially while drinking.